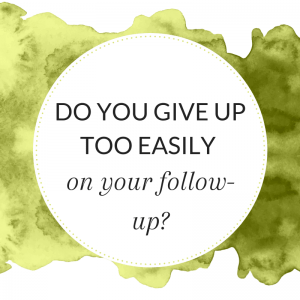 Do you give up too easily on your follow-up? Far too many people direct sales or party plan are afraid of rejection. They’re afraid of hearing the word “no”. And I get it. I used to be afraid of rejection. In the first 2 years in my business I did not sponsor anybody. At all! I was afraid to ask and by avoiding the ask I rejected myself in advance. I was saying “no” to myself before anybody else had a chance to. You need to change your outlook on asking and following up. Because there’s nothing to lose by asking. But what actually happened? In reality nothing happened because before you asked she wasn’t on your team and she wasn’t hosting a party. And after asking that’s still the situation. And you’ve spent your whole life without her on your team so you know how to deal with that! 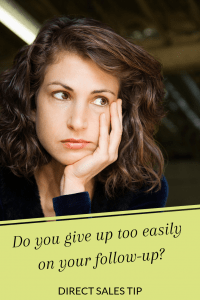 There’s an art (or a science) to asking and getting what you want. I found some great tips in the book The Alladin Factor by Marc Victor Hansen and Jack Canfield. Ask your lead to join as if you expect them to. Ask with a positive expectation, as if you expect to get a “yes”. Assume you can get new team members (or bookings). Assume you can get a “yes”. Ask repeatedly. One of the most important traits of success is persistence. So don’t give up. 94% of all sales people quit after the 4th call. However, 60% of all sales are made after the 4th call! I didn’t want to keep missing out on 60% of my bookings or recruits because I wasn’t asking and following up enough. Read this article for more on using a leads book to ensure you have a system for following up. You need to get used to the idea that there’s going to be lot of rejection along the way to your goals. Don’t take the rejection personally – they are not rejecting you as a person. Don’t give up. Develop tenacity and persistence. When someone says “no”, you ask someone else. It’s that simple.